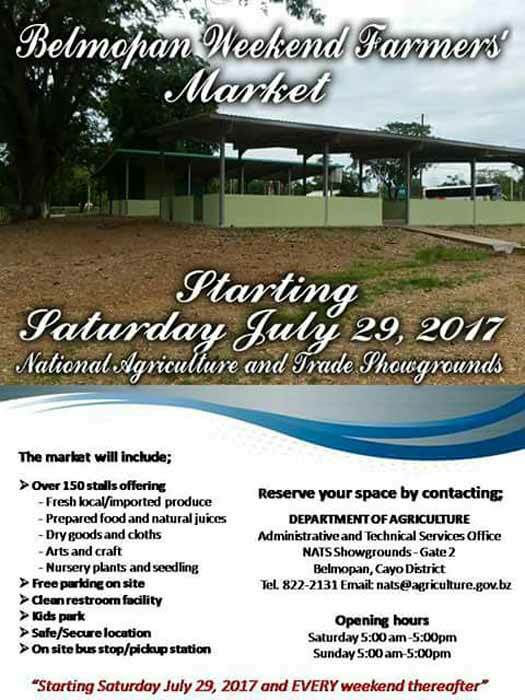 The Ministry of Agriculture is pleased to announce the opening of its new Belmopan Weekend Farmers’ Market on Saturday, July 29th, 2017 at the National Agriculture and Trade Show Grounds. The market will include over 150 stalls offering fresh local and imported produce, nursery plants and seedlings, prepared foods, arts and crafts, dry goods and clothing, free parking on site, a kid’s park, clean restroom facilities, and an onsite bus stop and pickup station. Saturday: 5:00 a.m. – 5:00 p.m.
Sunday: 5:00 a.m. – 5:00 p.m. The Ministry of Agriculture continues to work diligently in improving the use of the National Agriculture and Trade Show Grounds facilities as well as assisting small farmers with new and innovative best farming technologies. An open invitation is extended to all the surrounding towns and villages to take advantage of the new market.